DEAN JANG ENTERPRISES CO., LTD.
Dean Jang Enterprises Co.. Ltd. is building up in 1986. We are main engaged in key cam lock. 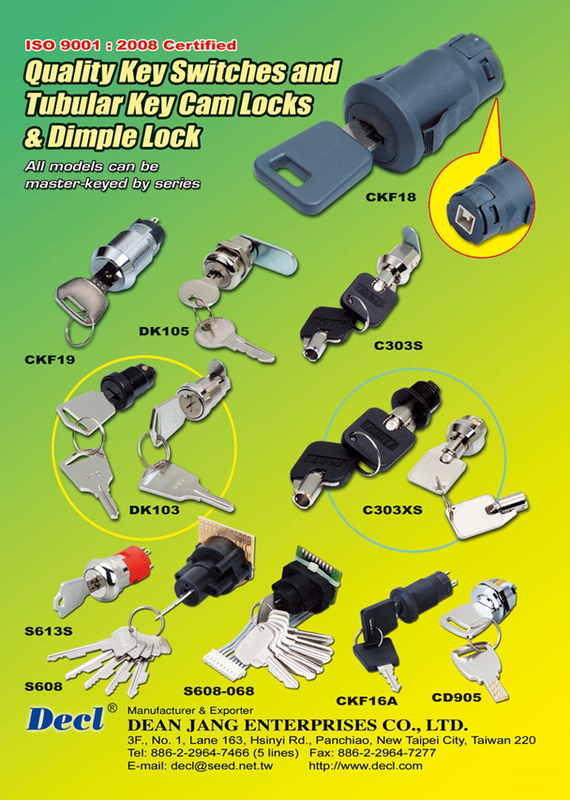 and key switch lock production in Taiwan and export them to the wide world markets. Our products can be used for computer component, drawer and cash box etc, and also POS machines, ATM machines, gaming/gambling machines, PACHINKO machines etc... The high quality have wined a well position and high value from our clients. Therefore, for further promoting our product, we are making efforts in auto-production and keep develpe new one to satisify market demends, we are sincerely to have an opportunity to cooperate with you, Please contact us in time.